Sparkling wine breakfasts, early morning balloon flights, exclusive experiences and the best of Spain are all yours on the ultimate tour for couples with 14 days of romantic encounters in Europe’s most romantic country. Go from beaches to hammams, wine regions to helicopter flights, flamenco to tapas to pintxos with all of it accompanied by the country’s finest boutique accommodation. This luxurious handcrafted journey is designed just for two and will be a celebration for the ages. For the best Spain travel ideas, explore additional Spain tours and vacations available on Zicasso. Spain is utterly romantic. Sure, it might not have the romantic fame of Italy or France, but it has far more to offer couples, especially with experiences that few have enjoyed. This handcrafted tour for two focuses on exclusive experiences to show you Spain in a way that others have not. 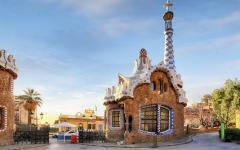 Rather than queue for a Gaudi building, you will have exclusive sunset access to one of Gaudi’s rooftops. They say the best view of Granada and the Alhambra comes from Mirador de San Nicolas, but that will be nothing on the view you have from a hot air balloon. Instead of merely wine tasting, you will go tasting in a town’s mazy, four-century-old cellar. This tour is all about the special moments, and it will be filled with select attractions that you only want to experience together. The two of you will travel to five distinctive overnight destinations with romantic accommodation in small, boutique hotels. Almost all of your tours are private, and most of the experiences are rarely seen on tourist itineraries. The itinerary will not be too busy, which will allow you lots of time to explore on your own together, especially in cities like Barcelona and Seville, as well as plenty of mornings to sleep in and enjoy each other’s company. Most destinations are connected by internal flights, although there are some road transfers as well. 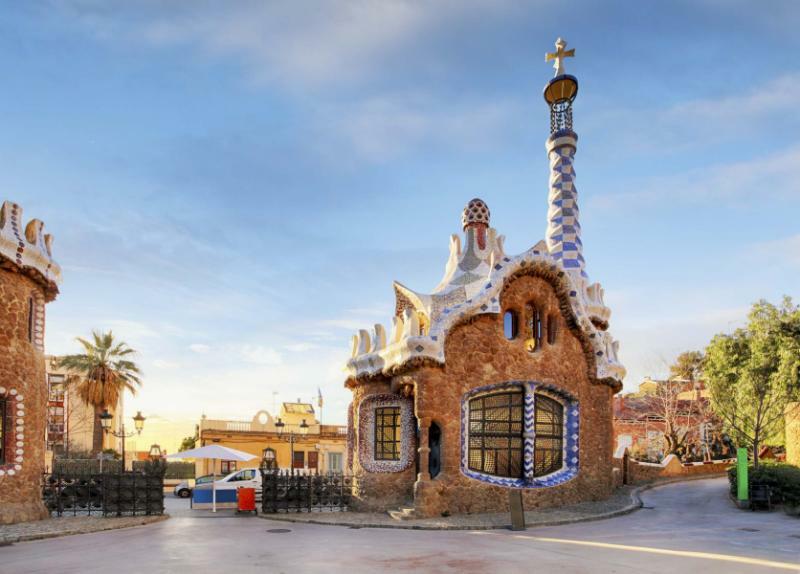 Start off with four nights in Barcelona with the first 24 hours on your own to settle in before private after-hours access to Gaudi’s La Pedrera. 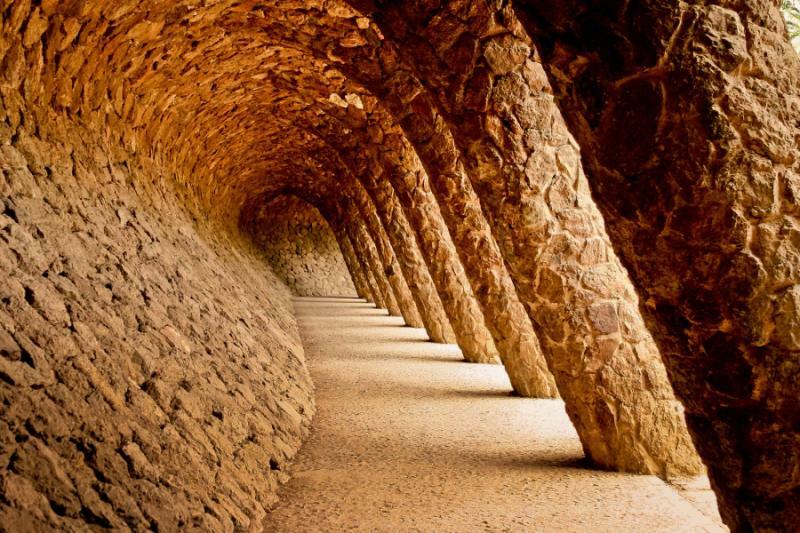 Helicopter above Catalonia the next day, and then take a sidecar through Barcelona the following, experiences that come on either side of a luxurious private wine tasting in Penedes, the home of Cava. Fly next to Bilbao, and then get your head around the Guggenheim before two nights in San Sebastian, an elegant beach town on Spain’s northern coast. Here you can relax as you stroll the promenade, sample the pintxo bars, lounge on the beach and discover why royal couples were coming here to relax even centuries ago. 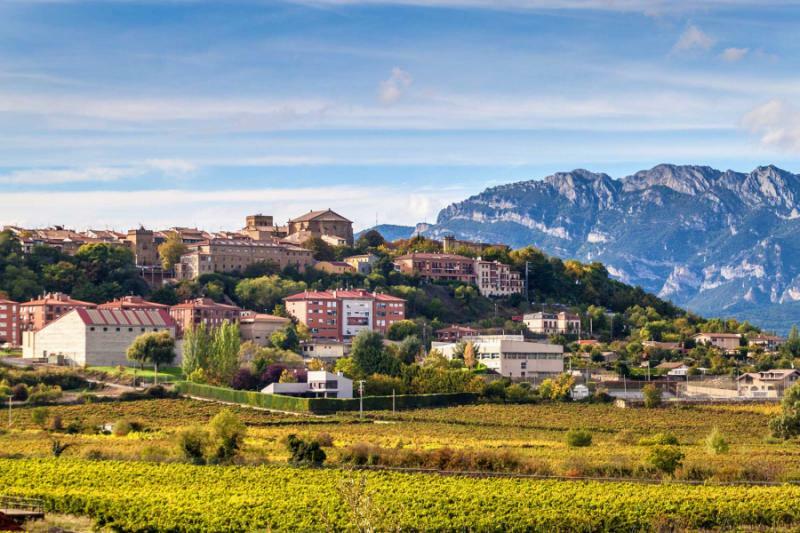 Weave into the Rioja wine-lands on day seven, tasting at two vineyards before sinking into the medieval cellars of Laguardia, as laid-back and amorous a town as any in Spain. It will then be a short transfer back to Bilbao from here, where you can fly to Seville and get your city introduction with a horse and carriage ride. That evening, you will go tapas hopping in the place where tapas originates. Other Andalusian specialties are to come with a day trip to Ronda and an authentic flamenco performance. End in Granada, the picture-perfect city that is perched on a hill and remembers the Moors. Hot air balloon above the city, tour the Alhambra, try the hammam experience, and visit nearby Ubeda and Baeza. Your two weeks in Spain will whizz by, and you will have memories to last a lifetime together. 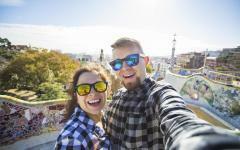 Consider learning more about our travelers’ favorite Spain travel experiences by reading their Spain travel reviews. With all its spires and Gothic style, the heart of Barcelona is always a romantic place to start. Wine bars sneak their way into Roman stone while colorful boutiques hide down the mazy lanes of Barri Gotic. The Mediterranean is just steps from your hotel, where super-yachts lull and beaches await. Touch down and transfer privately to your hotel, where the honeymoon suite is on the top floor and has a small balcony looking out on the city. This day is at your leisure as you settle in, so head out into Barcelona and see why the city is so special, perhaps returning for some sunset viewing from your balcony. Wake up late, or wake up early and stay in bed. This is a romantic escape, and you have two weeks, so why start rushing on the first morning? Call for breakfast in your room and eat it on the balcony, or perhaps go back to bed. Maybe take a walk through the quiet morning streets, and then plan your own day in the city, perhaps visiting one of the big iconic attractions such as La Sagrada Familia. 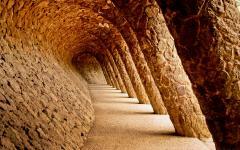 This evening you will ascend to the rooftop of La Pedrera, one of Gaudi’s forgotten masterpieces. Everybody else will have left for the day, so it will just be the two of you and a bottle of Cava, a sparkling wine. Sculptures and chimneys appear to dance across the rooftop as you stand on the Modernista legacy. Toast to life together as the city lights begin to twinkle, your first full day in Spain coming to an end. Jagged mountains rise behind Barcelona, scorched by yellow and red hues. Cathedral spires rise high, dominating the cityscape. 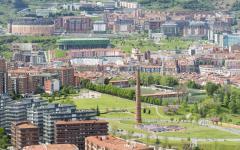 Famous monuments are clearly visible, including Camp Nou, Park Guell, Olympic Stadium and Barceloneta. You will be in a helicopter, soaring above Barcelona then out to Montserrat, where a monastery appears serene down below. The views will bring another angle on Catalonia, taking you from mountains to the vineyards, the city to the Mediterranean. After you touch back down, it will be to some free time in the city for a chance to explore more of the famous attractions, or to lounge on the beach, or to spend three hours over lunch, or whatever else suits the two of you. This is the best part of spending time in Barcelona, as there is so much to experience. Vineyards flutter in the cooling Mediterranean breeze and stretch green and true, carpeting Catalonia’s slopes with the promise of a crisp, sparkling wine. 95% of Spanish Cava comes from Catalonia, and the best vineyards can comfortably rival anywhere in Champagne. Tour a winery before tasting with a view, likely a bottle of vintage brut reserve opened just for you. At a second winery, you will get more bubbles, this time washing down a feast of Catalonian foods. Over the two tasting sessions you will come to appreciate the differences in Cava’s styles and why some vintages are more revered than others. This evening you will be in a sidecar whizzing around the back-streets and narrow lanes as a passenger, getting the complete Barcelona tour without getting stuck in traffic. Move past the Columbus Statue, alongside the beach, and through a neighborhood of Modernist buildings, up Montjuic Hill, and then down into areas that do not look wide enough for even a sidecar. I will prove an intoxicating way to see Barcelona from another angle, especially when the city’s evening personality is coming out to play. There will be another late start tomorrow, so you might stay out long into the night, dining and drinking in the old part of the city. Fly to Bilbao and marvel at the Guggenheim. Metallic curves will greet you, leading you down some steps to an entrance barely wide enough for two. Head inside the famous museum, and suddenly you will be hit by a sense of space. Exhibitions fill huge spaces, sculpture and painting and audiovisual excitement. 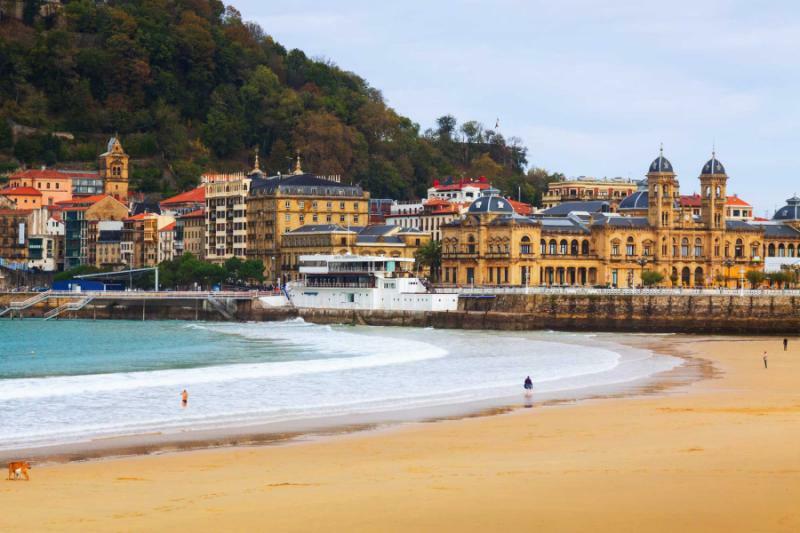 After a guided tour of the galleries, you will travel along the coast to San Sebastian, the darling of Spain’s beach towns. Sunsets are sublime here, best enjoyed from the promenade, or the balcony of your five-star hotel. Tonight will be spent on pintxos, a Basque culinary specialty. Tasty morsels of food grab your attention, and you will try one or two at each bar. It’s not tapas, as it’s more like gourmet dining in a light-hearted, informal style. Open the curtains to the coast, and then enjoy your breakfast in the hotel’s late-19th-century dining room. Go lounge on the beach or walk along La Concha Bay to see the rusting sculptures on the cliffs. Check out the town’s elegant townhouses and churches, and then head into its cobblestoned medieval core. 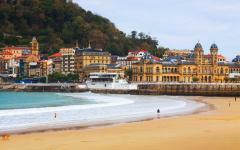 Visiting couples have been enchanted by San Sebastian for two centuries now, including plenty of royalty during the 1800s. You will have the beach and a quaint town in one place, yet none of the bustle or noise associated with Spain’s other beach resorts. 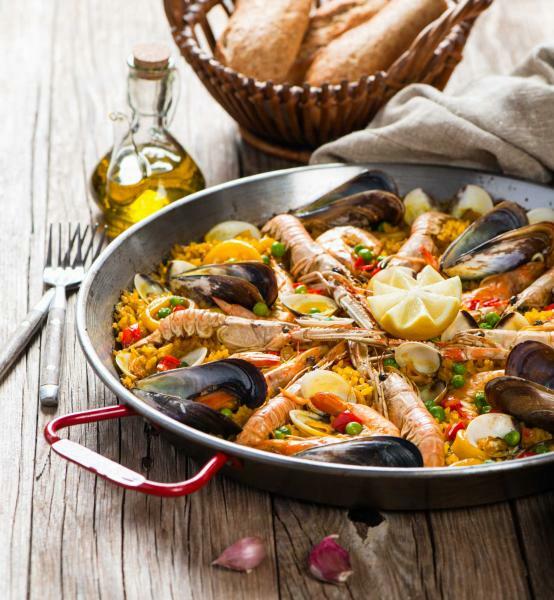 You will have the best food in Spain all around you. 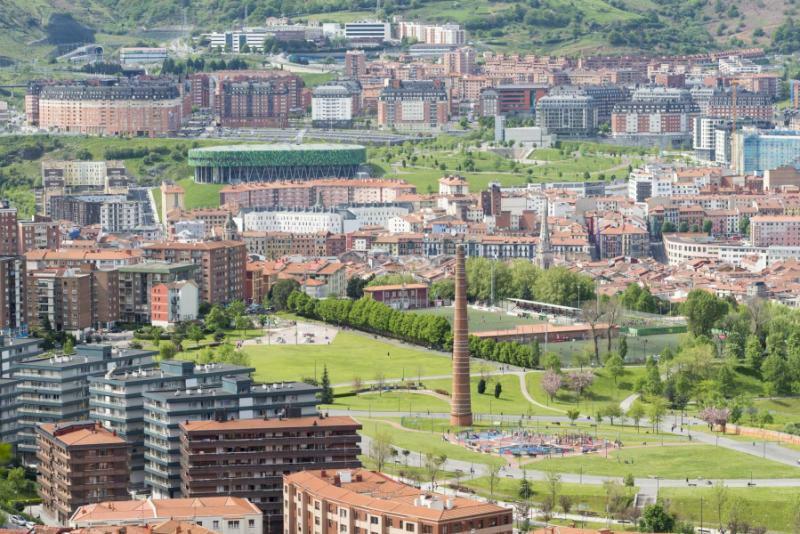 Basque is the country’s culinary capital, and it’s San Sebastian where you can taste all the diversity, whether you prefer fine dining or pintxos hopping. Out into the hills, you go with the coastal vistas giving way to a blanket of olive groves and grapevines. 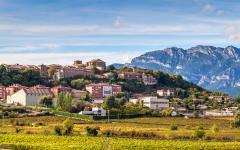 Welcome to Rioja, Spain’s famously soporific wine region. Over 500 wineries are nestled in these hills, and you will visit at least three. One is tiny, a family-owned boutique where everything is made by hand. Another is huge, a big exporter you will probably have heard of, and the third will be new-world, producing wines in a style not before known here. 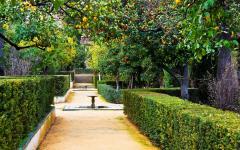 You will be staying in Laguardia, a quiet old town with a wonderful secret. This evening a local guide will take you down some steps into the town’s interconnected wine cellars. Memorably musty smells accompany your wine tasting down here, and by the time you emerge above ground, a lot of wine will have been consumed. Do not worry, as that is always the case in Rioja, which is why it is such a laid-back place. Head back to Bilbao and fly direct to Seville, a city of rich Spanish splendor and eye-popping architecture. It’s a city that’s also got a fiery underbelly, shown on streets that emanate passion and excess. 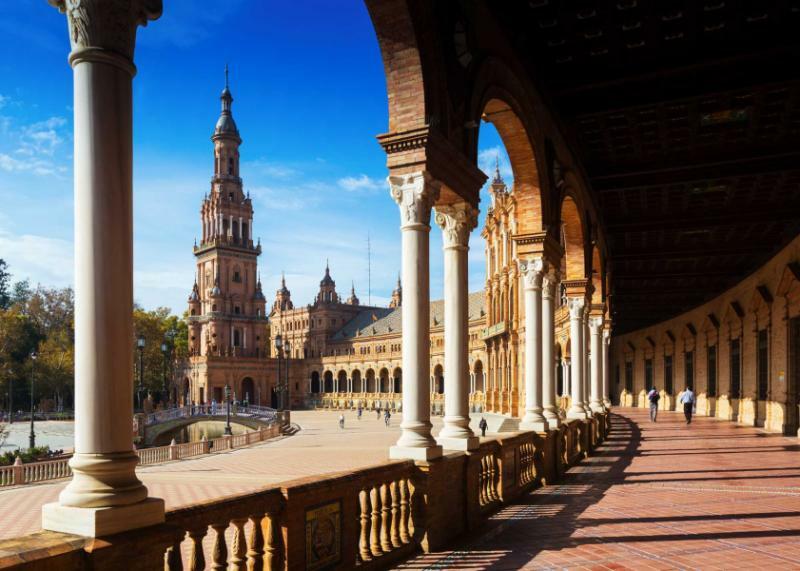 Seville is romance from the moment you land, so you will drop your bags at the hotel and tour the old city in a horse and carriage, sitting back in the shade as monuments to the Moors and conquistadors roll by. Head through 12th-century gardens, trot past the enormous cathedral, admire the changes in architectural style, pass Torre del Oro and end up back at the hotel. It’s the best of Seville in two hours, without you having to leave your seat. Tonight you will return to the streets to walk through it all. Well, more like crawling. 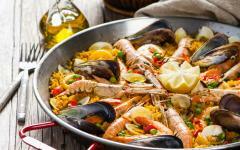 Tapas is just one of the iconic Spanish treats that originates in Andalusia, the region that Seville is capital of. Each bar has its own specialty, and your local guide shows you the way. It’s not that romantic to be stuck just two of you with a guide, so instead, your guide will show you how it all works and give you a detailed map so that you will know where to go and, very importantly, what to ask for when you get there. You will dine with the locals in atmospheric taverns, tasting your way through classic Spanish flavors and all manner of different wines. One of Spain’s less celebrated romantic highlights is how late everything starts. Nothing gets going until 10am, so you can sleep in without fear of missing out on something. Even with a full day trip planned, there is no need to rush. Plus, Spain is most romantic in the evenings when the terraces are filled with chatter and the lanes are lit mostly by lanterns. Most couples want to stay out as long as they can, so the late morning starts are almost essential. 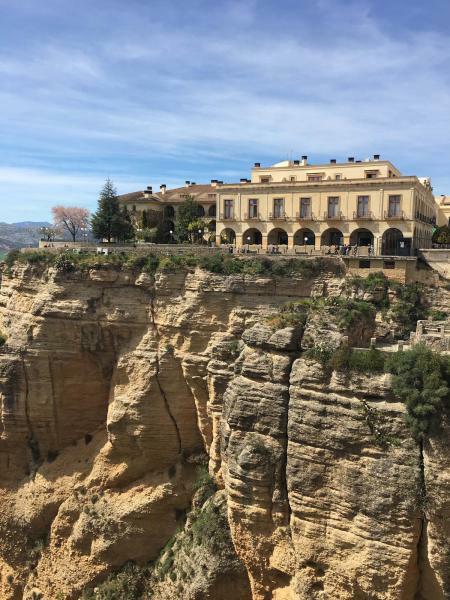 Today you are heading to Ronda, a blissful whitewashed town straddling a dramatic gorge. You can head into the mountains and wander hand in hand through its history, past a bullring, along artisanal streets, out to viewpoints, then to an al fresco lunch terrace beneath a church. Then back in Seville there’s no shortage of tapas bars and restaurants to enjoy this evening. 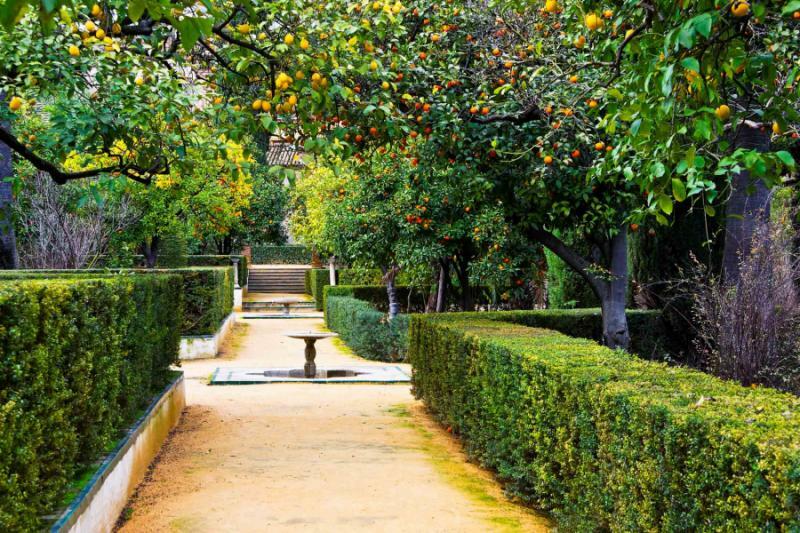 Spend today exploring Seville at your own pace, from the cathedral where Columbus is buried to an old Moorish palace and some intimate old gardens. This evening, you will visit Triana, a small district where flamenco took shape some 300 years ago. You will watch a show in a tavern where all the best flamenco artists want to perform. Profound voices echo through the room, haunting in their scope and elegance. The guitar starts slow and then explodes into life with so many strings plucked, seemingly at the same time. Red dresses swirl as the dancers click their feet. People clap along, engrossed in the performance. And still the flamenco grows more passionate, intense songs of love to carry you away. It’s in the home of flamenco that you can truly realize this art form, on a table for a two in a dimly lit corner of a famous old tavern. 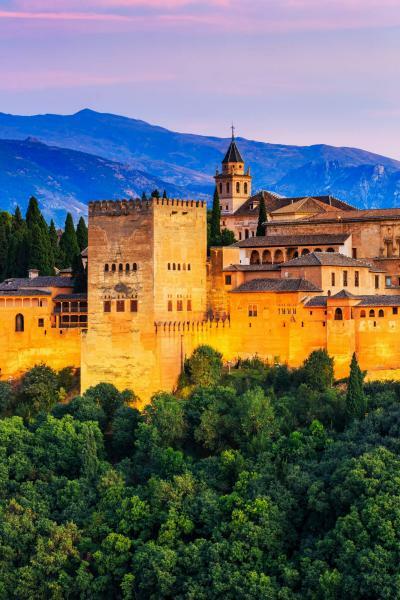 Granada is your final destination, a dazzling Moorish stronghold that seems to resemble a movie set. Every street appears postcard perfect, from intricate archways and doorways to small plazas and tapas bites. And then there is the Alhambra, perhaps the finest and most ornate building anywhere in the world, certainly one of the most romantic. Tour this lavish palace and its gardens with a local guide, learning its history and intricacies. It takes three hours, and there is a good chance that you will fall silent because when confronted with such monumental beauty it is hard to know what to say. When that famous attraction is finished, you will be left in the heart of Granada, making your own route along the narrow streets. The best view of Granada and the Alhambra does not come from Mirador de San Nicolas, which is always packed with tourists, but from much higher in the air in a hot air balloon. It will be an early start as you climb high at sunrise, sailing over Sacromonte and Albaicin as the Alhambra glows golden in the morning light. Touch down to breakfast with sparkling wine in the countryside, the picnic spot shaded by towering mountains, and then indulge some more in a traditional hammam. Dozens of them once covered Granada, but they were all shut down in the 16th century. The one you visit was the first to reopen, and it is classically Arab in style, filled with beautiful tiles and mosaics, ideal for half a day of massages, red grape soap, and essential oils. The final day on this 14-day Spain tour takes you to two UNESCO World Heritage towns, immersing you in the beautiful harmony of Morisco art. Moriscos were the Moors who converted to Christianity, and they married the traditional Eastern and Arab style with influence imported from the Italian Renaissance. The results are staggering, and these two towns have been superbly preserved providing great settings to walk in hand in hand. 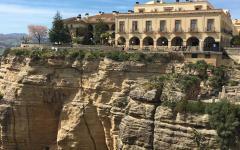 Back in Granada this evening there are tapas bars and viewpoints aplenty, but maybe you retire early to your boutique hotel, where a balcony lets you take in the city’s sounds and smells in private. Two weeks spent in Spain, and there are still new memories to make. Just walking through one of these old cities brings something new and amorous, even if you have walked the same streets before. The day is left free, and late check out has been arranged, as you should never rush a final morning on vacation, leading to a private transfer to Granada’s airport and your departure to home. "The guides were all top notch - knowledgeable, friendly and helpful." 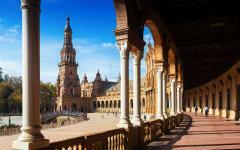 "We had a wonderful, relaxing trip thanks to this Spain travel company."